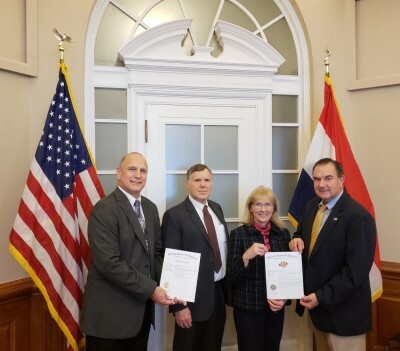 Missouri Lieutenant Governor Mike Kehoe recognized Danna McKitrick, P.C. and Associated Industries of Missouri (AIM) for their assistance in registering the "Buy Missouri" trademarks for the state. For information on the Buy Missouri program, go to https://ltgov.mo.gov/tourism-economic-development/buy-mo/.